The audience in Mason Temple was justifiably enrapture as Martin Luther King, Jr., preached yet another griping and inspiring sermon. As he moved to conclude the sermon his mind--and the minds of the audience--were drawn once again to the weapons and bombs that were threatened and used against them.Martin's flight to Memphis for this cause had been delayed by yet another bomb threat.He concluded the sermon, "We've got some difficult days ahead. But it doesn't matter with me now. Because I've been to the mountaintop. And I don't mind." As the imagery settled, he continued: "Like anybody, I would like to live a long life. Longevity has its place. But I'm not concerned about that now. I just want to do God's will." This would prove to be a dark foreshadowing of the limited time left on earth for Martin. He finished"And He's allowed me to go up to the mountain. And I've looked over. And I've seen the promised land. I may not get there with you. But I want you to know tonight, that we, as a people, will get to the promised land. So I'm happy, tonight. I'm not worried about anything. I'm not fearing any man. Mine eyes have seen the glory of the coming of the Lord. "With these words, Martin ended his sermon and went back to room 306--a room he had stayed in often--at the Lorraine Motel in Memphis. Martin led countless individuals in the struggle for civil rights in the United State of America. He was one of the founders of the influential Southern Christian Leadership Conference (SCLC) and gave direction to people looking for a way to resist the powerful and abusive parts of the American power structure. They marched and met and slowly raised the consciousness of the American people in relation to the struggle that they were undergoing simply for equality and justice. One of the foundational tenets of Martin's leadership was the philosophy of nonviolence. This philosophy led to many sit-ins and passive forms of resistance which proved to be especially powerful in a nation where media were looking for a story. He drew the inspiration for how he might best resist nonviolently from Jesus, Gandhi, and the writings of Howard Thurman. With each nonviolent protest, they were met with violent opposition from those who hated their very existence. They absorbed the wrath and evil intentions of their enemies and offered them something resembling love and forgiveness in return. As the violence escalated, Martin and those who followed after him suffered even more. But the power was found in the increased awareness of the rightness of their side and the wrongness of their enemies as their enemies perpetrated great evil in an attempt to remain powerful. In other words, the nonviolent protest of Martin and his people provided a canvas upon which the inherent, institutional evil could take form and be recognized. With every blow and wound they received they gave witness to the evil that motivated such injustice. Martin was a preacher and recognized the power of the spoken word both to inspire and provoke. It seems that at every stop he would be in a church preaching to a capacity crowd about the inherent spirituality of what was going on. The civil rights campaign was not his only cause. After much reflection his nonviolence extended into his political life and he became a leader in the cause to end the Vietnam war. This did not gain him any popularity among the powerful--many of whom he had already offended--but it did help to ease his own conscience as he considered what his faith and calling demanded of him. He preached and he taught and in so doing he excited the joy of his audience and the antipathies of his opponents. So many of them were regular members and attenders of a church but saw no problem with the injustice and evil that they supported. Martin's preaching demanded awareness from those that supported him and those that resisted him. He didn't just help reform American political attitudes. He began the process of reforming the Church in America and around the world. 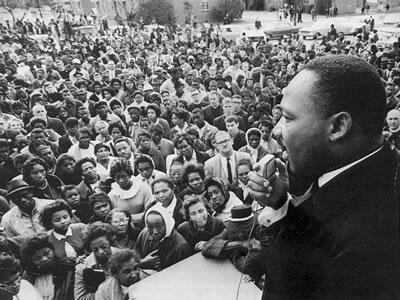 At 6:00 p.m. in the evening of the fourth day of April--in the year 1968--Martin prepared to leave room 306 and go to another church to preach another sermon in support of the sanitation workers in Memphis. By doing this, he was further living into his conviction: "true compassion is more than flinging a coin to a beggar....it comes to see that an edifice which produces beggars needs restructuring." As he stepped out the door he turned to the musician who was with him--Ben Branch--and said: "Ben, make sure you play Take My Hand, Precious Lord in the meeting tonight. Play it real pretty." At 6:01, a shot rang out and a bullet entered Martin's head and settled in his spinal column. The man who had received the Nobel Peace Prize for working through nonviolence and civil disobedience to end racial injustice was gunned down in Memphis on his way to preach a sermon commanding love for enemies. He died a martyr and was buried shortly thereafter in a funeral that was widely attended. According to his wishes, nobody talked about his many awards or degrees but, rather, his wife chose to play a recording of a recent sermon in which he said he'd rather be known for being a man who tried to "feed the hungry", "clothe the naked", "be right on the war question", and "love and serve humanity." As the preacher got one more chance to preach--an honor he would have indubitably enjoyed--Mahalia Jackson sang Take My Hand, Precious Lord and a nation laid to rest a martyr and prophet.